Last evening we hosted and enjoyed a dinner party with good friends and, I immodestly add, good food. The special Veal dish was a surprise for our French friend Jean-Michel who literally lit up when he was told of the main course. It was served with Buttered Noodles and a side of roasted Cauliflower florets. A 1990 Medoc accompanied the dinner. I believe it’s safe to say that the evening went well and was well received. 1. Place Veal if a casserole and cover with cold water by 2 inches. Bring to the simmer and simmer 2 minutes. Drain the veal and wash it rapidly under cold water to remove all traces of scum. Wash out casserole and return meat to it. necessary for several minutes. Add the Vegetables and Herb Bouquet. Taste for seasoning and salt lightly if necessary. Cover partially and simmer very slowly for 2 hours, or until Veal is tender when pierced with a fork. 3. 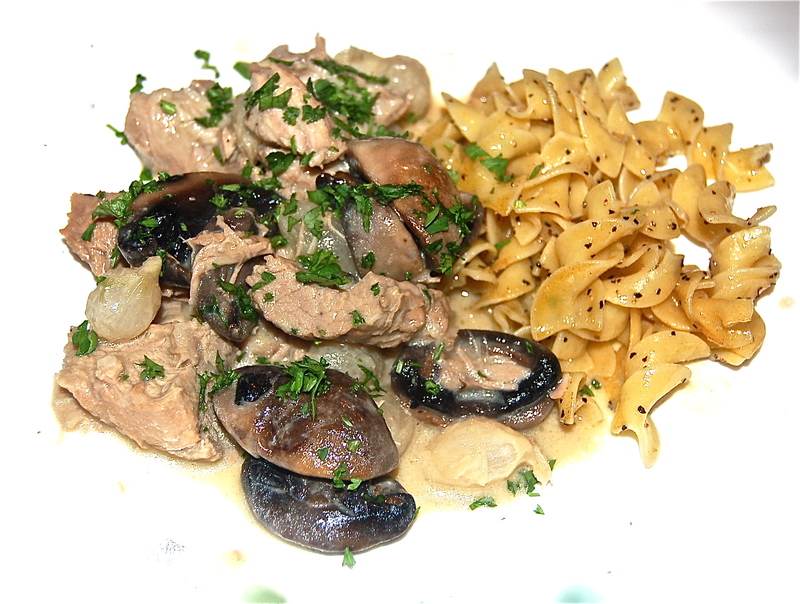 When the Veal is tender, pour the contents of the casserole into a colander set over a bowl. Reserve stock. Rinse out the casserole and return meat to it, removing any loose bones. While the Blanquette is simmering, prepare the Onions. Pierce a cross in the root ends and simmer for 30 to 40 minutes in a small covered saucepan with the Veal Stock, Salt and Butter. Arrange the cooked Onions over the Meat. 1. In a large saucepan, melt the Butter, add the Flour, and stir over low heat until they foam together for 2 minutes. 2. Off heat, pour in the Veal Stock, beating vigorously with a wire whip. Bring the Sauce to the boil, stirring. Simmer for 20 minutes, frequently skimming off the film which rises to the surface. 3. Fold in the Mushrooms and simmer for 10 minutes more, skimming. Taste the Sauce very carefully for seasoning, adding Salt, Pepper and Lemon Juice to taste. 4. Pour the Sauce and Mushrooms over the Veal and Onions. Film the top of the Sauce with 2 spoonfuls of Cream or Stock to prevent a skin from forming. Set aside, partially covered. The dish may be done ahead to this point. 1. About 10-15 minutes before serving, reheat slowly to the simmer, basing the Veal with the Sauce. Cover and simmer for 5 minutes. Remove from heat. 2. Blend the Egg Yolks and Cream in a bowl with a wire whisk. Beat in by spoonfuls 1 C of the hot Sauce. Then pour the mixture into the casserole, tilting it and basting the Veal and Vegetables to blend the rest of the Sauce with the Egg Yolk mixture. 3. Set over moderate heat, gently shaking the casserole until Sauce has thickened lightly, but do not let it come to the simmer. Serve with buttered Noodles, Rice or Potatoes.